The Foundation (Stiftung) Humor Hilft Heilen was established in 2008 by Dr. Eckart von Hirschhausen, a well-known personality in Germany, who, after studying and practicing medicine himself, traded in his doctor coat to be a medical cabaret artist on stage and TV. 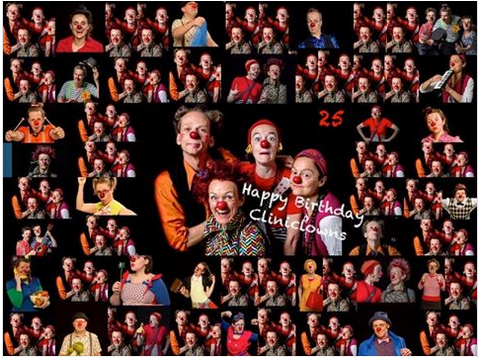 Funding healthcare clowning – in 2019 HHH engages 40+ clowns visiting children’s hospitals, palliative facilities and nursing homes in more than 25 locations across Germany. The clown visits vary between twice a week and monthly. Conducting workshops for medical staff throughout Germany employing a workshop concept created and brought to HHH by Michael Christensen. Projecting and supporting scientific studies which deal with the effects of clinic clowning and humor. shared in-depth knowledge and their experiences in professional fundraising. Greetings from our Finnish efhco member Sairaalaklovnit. This great project by the Ministry of Education and Culture enabled a new type of study and impact assessment of hospital clowns, encourages the role of artistic and cultural activities in health and social services, well-established in many wards across Finland. Hospital clowns and the HUS children’s Hospital, Helsinki joined the Ministry’s project to measure the actual impact of the clowns’ work on the smoothness of procedures and the experiences of the young patients. 25 years of bringing smiles into now 40 hospitals and institutions! This year’s efhco’s Annual Meeting was held in September 2018 in the Czech capital city of Prague, organized and hosted by our Czech member, Zdravotni Klaun. The chairwoman, Monica Culen, welcomed as guest’s two additional healthcare organizations to the meeting, from Germany and Italy, both interested in a possible efhco membership in the future. Besides tackling the ongoing legal necessities of our European Federation (minutes, finances, memberships) all attendees devoted time on the exchange topic ‘What’s the state of our institution?’ and on the further development of efhco goals. Paulien Trapman, the efhco coordinator since 2011, was organizing her last meeting for efhco and would be leaving efhco at the end of September. Paulien received an outstanding Thank You from all members for her excellent job, her never-ending support and to her efforts in growing the federation and its member organizations. The next day the attendees had the opportunity to acquire new skills or to test the waters in a workshop on aerial acrobatics, ground acrobatics, juggling of all kinds, rola-bola, rope walking or unicycle – offered by the local circus CIRQUEON. We are looking forward meeting again next September in Switzerland.